The clever and easy to use Speciality Trees Treefinder application has been available on their website for some time, but now it is here on iPhone. 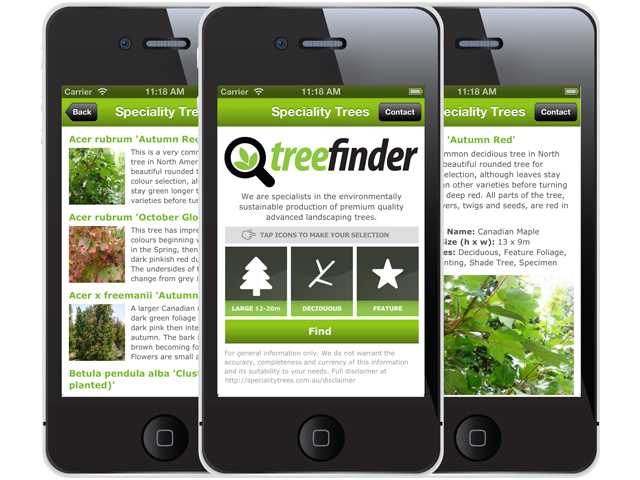 Easily downloaded from the App Store, and with over 300 trees for immediate review, the free iPhone version of Treefinder enables users to conveniently identify, browse and compile a list of trees suitable for a number of common landscaping uses from the planting a large feature tree, to lining a driveway or creating a formal screen or hedge. And you can do it anytime and anywhere! By simply selecting height, type and intended use, what opens up is a world of possibilities. With links to their library, you can get a short description of the tree or more detailed growing information. Roll selections through to their website and you can create and save your own list! Insert your name and contact details and they’ll supply information on price and availability. As experts in their field, let Speciality Trees help you find the right tree for your needs.